Â Relive the magical moment when the stars of DOCTOR WHO – MATT SMITH, KAREN GILLAN and ARTHUR DARVILL – made a surprise appearance at the Official Doctor Who Tumblr (http://www.doctorwho.tumblr.com) Meetup in San Diego on July 14, 2012. From time to time I found something interesting about Doctor Who practical things that come in the real world. For example, Doctor Who @ tumblr announced about this universal remote control that looks exactly like Doctor Who sonic screwdrive, even it does some other things than the original thing. Not yet, anyway. The remote control will goÂ on sale August 31, 2012 exclusively for the first 60 days at ThinkGeek and the BBC America Shop in the US, and Forbidden Planet and Firebox.com in the UK… so you’ll have to wait some time to get it. Until then you can read the description from tumblr. 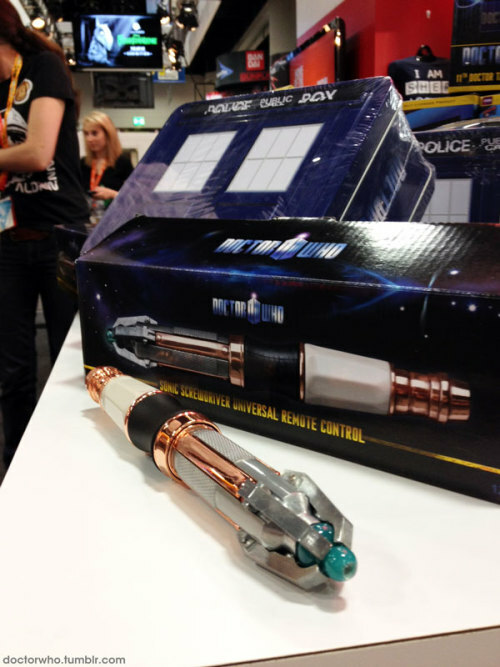 The Wand Company – known for developing the Worldâ€™s first infrared remote control magic wand and BBC Worldwide today reveal a must-have accessory for Doctor Who fans â€“ the Sonic Screwdriver Universal Remote Control. Join BBC Worldwide in the North American unveiling of the remote control at the 2012 San Diego Comic-Con, in BBC AMERICA booth #3629 starting preview night July 11 through the end of Comic Con. A high quality metal replica of the Mark VII Sonic Screwdriver currently used by the Eleventh Doctor, Matt Smith, the new Sonic Screwdriver Universal Remote Control is a gesture-based universal remote control that utilises infrared (IR) technology to manipulate almost all earth-based home entertainment systems – from TVs and iPod docks to DVD/Blu-ray players and beyond. With a green flashing tip and an impressive four operational modes â€“ including a practice mode â€“ and three memory banks, a total of 39 commands can be stored in the Sonic Screwdriver Universal Remote Control, giving the option of operating multiple home entertainment devices with just a different flick of the wrist. We just played with it at the BBC America booth and itâ€™s pretty easy to use. Itâ€™s also really really cool. As it was announced a few weeks ago Jenna-Louise Coleman will play The Doctorâ€™s new and as yet unnamed companion in the hit British sci-fi TV series Doctor Who. Coleman will be introduced to audiences for the first time in the showâ€™s 2012 Christmas Special following the departure of the current companion Amy Pond, played by Karen Gillan, who will leave in episode 5 of the upcoming Series (7). The source of the image isÂ BBC America onÂ tumblr. The pictures with the moments when people KNEWÂ were taken from tumblrÂ and the music is Chameleon circuit – The Doctor is dying. It’s all true.